Cilantro rice, matches well and is a ideal combo with mexican food ,also is a filler in burritos,and burrito bowls.My encounter with this recipe was at Chipotle. For its delicious flavour and taste i am hooked on this.And it makes a good side dish for mexican with its fragrance hint..i tried it in my own way,after searching for the recipe,and could successfully prepare the burrito bowl recipe on one fine day evening for dinner.So here i shared the cilantro rice recipe done in my kitchen in my way ,which is main important in burrito bowl recipe..
Place a pan on the stove. 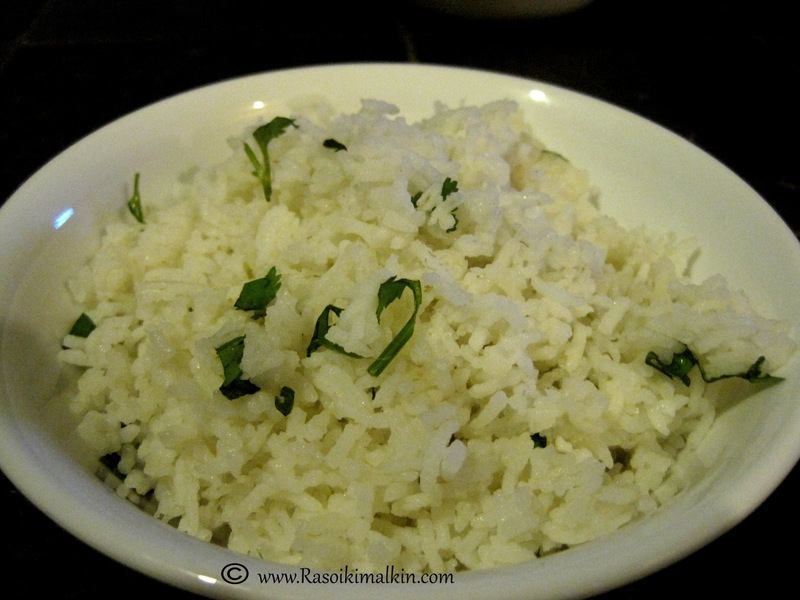 Saute cooked rice on low heat,in a tbsp butter,then add chopped cilantro and lime juice. Mix well.Fluf cooked rice with a fork and keep covered. Serve it in with other mexican cuisine as burrito bowl or with tortillas as burritos. Next follows black beans recipe for home made burrito bowl..
looks so yummy...mouth watering ..
wow...it is sooo easy to make...superb..
nice combination with ..gravy dish!